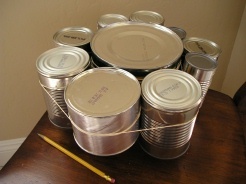 Dig through your recycling bin to find some tin cans to make this great Tin Can Xylophone. Use some pencils or other mallets you have around the house, and let's make some music! This is an easy craft to put together, but watch little hands since there may be sharp edges on the empty tin cans. •Tin cans, various sizes. Big ones like coffee cans are great! 1. Gather various sizes of empty tin cans, and rubber bands. Put a rubber band around two tin cans and start to add more cans. Secure with more rubber bands as needed (if you don't have many rubber bands, secure the cans with tape). To start making music, hit your xylophone with the rubber ends of pencils, or use mallets you already have around the house, and enjoy!